So tonight, I decided, after a lovely dinner with Pingaling, to treat myself. This pudding is so luscious, so creamy and smooth, so soft and silken and unctuous, that you can spread it all over yourself and bathe in it. It is like being enveloped in love and hugs and vanilla and sugar and sweetness. Its easy to make (about 20 minutes or less in terms of actual work time) and it is amazingly adaptable – brilliant either warm or cold. It would be a phenomenal base for a white chocolate ice cream (just cool in the fridge overnight, and pop into your ice cream maker!). It makes a brilliant accompaniment to any manner of cake, pie, pastry or crumble. It would be stunning as the filling for a deep dark chocolate cake or ginger cake (that could be iced with whipped cream!). Served with fruits (particularly berries), this is a dream. And thinned out with a little more milk or cream, its a surprising and delightful custard. Pour the milk into a medium saucepan, and split the vanilla pod. Scrape the beans into the milk, and pop the pod in there too. Heat the milk over your lowest heat, until it just starts to steam and bubble around the edges. This might take a while, so be patient, and busy yourself with other things while it is happening. Once the milk is just at the point of boiling, take off heat, and cover for 5 minutes to let the vanilla bean steep. If you are not using vanilla bean, allow the milk to cool down for about five minutes while you prepare the eggs. Crack the eggs into a medium bowl and add the egg yolks. Set the whites aside for another use. Add the salt and sugar, and begin to whisk. Let me just take a moment and state that I use light brown sugar in this recipe because I adore the slight caramel tones that the light brown brings to the flavour profile. 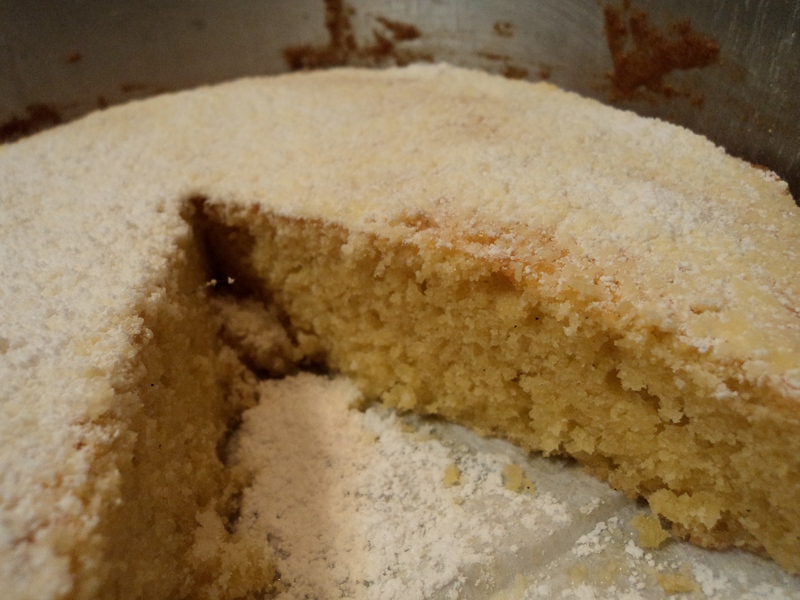 However, if you prefer a very pristine pale pudding, without the caramel-y notes, feel free to use white caster sugar. Whisk until the sugar has completely dissolved into the eggs. Once the milk has cooled for 5 minutes or so, fish out the vanilla pod (if using), and whisk in the white chocolate. Whisk well to ensure that all the chocolate is completely melted (it should do this relatively quickly). Add a tablespoon or so of vanilla essence at this point and taste. You should have very strong vanilla and white chocolate notes. They should complement each other, but also be distinct. Adjust if you like. Whisk about a third of the hot milk into the eggs, and continually whisking, add the egg-milk mixture back into the saucepan. Put the pudding over very low heat and whisk constantly until it begins to thicken and steam and tiny bubbles begin to pop onto the surface. Whisk in the butter. You need to keep your nerve here. Too long, and you get sweet, expensive, useless scrambled eggs. Too soon, and it doesnt thicken enough. Do remember though, that pudding does thicken substantially as it cools down. Its a balancing act, but I rather take off too soon than too late! You can always give it a little more heat if it does not set up as you would like it to. Hopefully, you will have rinsed the bowl you whisked the eggs and sugar in. Place a sieve over this bowl, and pour the pudding through, to ensure a beautiful smoothness. You now have a difficult choice. You could eat some pudding immediately (who am I kidding, I always do! Cook’s treat) … or place greaseproof paper over the surface of the pudding and refrigerate for about 2 hours or so until it has cooled and thickened completely. Today was a long day … loads of running about, and I woke up late, so it was like playing catch up! Had lunch with my oldest friend who was here on a visit from the west coast. Some people you can just pick up the threads where you left off, as if you had seen each other yesterday rather than decades ago. When it came time for dinner, I realised I had about half an hour before we sat down to eat. And the cupboard wasnt exactly full to bursting! So a frittata it was, with spinach, a few cherry tomatoes thrown in for colour, and seasoned with Asian spices – soy, toasted sesame oil, sesame seeds, some salty dried seaweed. Served on dark brown toast, it was delicious, easy, quick and warm. And for dessert? Ahh well, that was a wonderful crepe made by Jules – bursting with strawberry jam and covered in snow white icing sugar. A glass of milk is traditional with it, and who am I to buck tradition? All in all, a wonderful meal, made even better by eating with family and loved ones, in a safe warm space, while it is cold and rainy outside. This frittata will serve 4 people. It can easily be doubled to to accommodate more, or halved for just a few. Just remember to add eggs equal to the number of people you are serving, plus one. In a medium non stick frying pan, over medium high heat, saute the onions in the olive oil and sesame oil. Let the onions get soft and glossy, and then season with 1 tbsp soy sauce and the sesame seeds and roasted seaweed. Add all the spinach, and stir well to combine. You want the spinach to just wilt. Taste for seasonings, and adjust. I love roasted seaweed, so I usually add some more here, and if its not salty enough, you can drizzle over a bit more soy – though remember, you will be adding 1 tsp of soy to the eggs. Add the cherry tomatoes to the pan, and mix well. Lower heat. In a small bowl. whisk together the eggs, milk, 1 tsp soy sauce and wasabi. Pour over the spinach mixture, and let cook, disturbing the mixture only to poke little holes in it to allow the uncooked egg to get to the bottom of the pan. The entire cooking process may take anywhere up to 5 minutes. You will have a crusty bottom, and a creamy centre. Keep the heat low, and if the top is not cooking to your liking, cover to let it steam for only a few seconds. You can also finish this in the broiler oven, but only if your pan is oven proof! 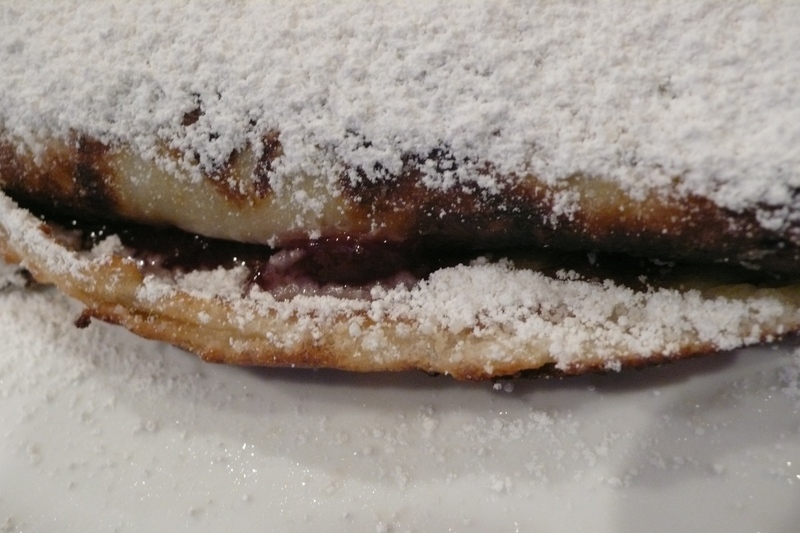 And if you happen to know any Austrians, try and have this sublime crepe with strawberries and powdered sugar for dessert! We went to the food mecca, Whole Foods, the other day and I saw some gorgeous broccoli rabe or rapini. Its kind of like kang kung, bok choi or kai lan back home, but it has these lovely little broccoli like florets hiding in the deep green leaves. Its also incredibly bitter, which can be a nicely astringent flavour, but it needs to be managed carefully, and juxtaposed against creamy, sweet and salty in order to truly shine. Tonight, I was looking for a really simple Asian inspired meal, because we have been eating rather richly of late. I wanted something clean, and yet rather toothsome. I decided to saute the rapini with sesame seeds, and a sweet salty sauce. But in order to manage its bitterness, I simmered the rapini in water for a few minutes before draining it and running under cold water. This fixed its colour and flavour, and allowed the rest of the saute to happen in minutes. It also mitigated that deep bitterness that some people find too pungent. With it, I served plain jasmine rice, which to me is food of the heavens. I love rice, and I cook it how my mother taught my sister, and my sister taught me. That is, without measurements, but by eye and rule of thumb. And I made a very simplified omelette which I cut into strips and served on the side. If you are vegan, just saute some tofu instead. Its all good, and makes for a light, quick, easy meal… with enough leftovers, hopefully, to make fried rice the next day! This recipe will feed 4 – 6 people depending on amounts, which are totally up to you, as you will see! Everyone has a different way of making rice. Usually at home, I make it in a rice cooker, but my sister believes in old school. Take 1 medium saucepan, and pour in some rice. I usually try and cover the bottom of the pan, up to about halfway up the pad of my thumb, may be an inch or so of rice… This should serve 4 people, but if you want leftovers, add more. Rinse the rice in the pot with cold water, draining the water out from the rice to get rid of a bit of starch. Do this at least three times, or until the water runs clear. Make sure the rice is in an even layer at the bottom of the saucepan. Pour in enough water so that if your thumb is resting against the top of the rice layer, the water comes up to the first joint fold of your thumb. I swear this works for just about anyone…. Put in a pinch of salt, and bring the entire thing to the boil. Once it has boiled, reduce to simmer, and cover with a tight fitting lid. Allow to simmer until the rice is done, about 15 – 20 minutes. Once the rice is completely cooked, fluff with a fork and serve. Its that simple, and that difficult … it is a matter of getting a feel of the rice, a feel for your own hands and measurements, and a feel for the timing of the thing. But it does work, and it is really easy once you get the hang of it! Prepare the rapini: cut off the bottom of the stems, and chop the rapini in small 1 inch chunks. Fill a large frying pan with water, and bring it to the boil. Tip the rapini in and boil for about 2 – 3 minutes. The rapini will turn a deep emerald green. This is good. Once it has boiled for a few minutes, tip it into a sieve and run cold water over to stop the cooking process. Set aside. Make the sauce. In a teacup or small bowl, combine all the ingredients, whisk with a fork, and taste. Adjust so it is sweet and nutty and salty and hot all at the same time. Add or subtract to your liking. Set aside. In the same frying pan, toast the sesame seeds. Once they turn light brown, and give off that distinctive sesame scent, add the oil and chopped onion. Saute for a minute or two until the onion has become soft. Add all the rapini, and cook for a few seconds, mixing in the sesame seeds and onion with the rapini. Pour the sauce over, and allow to bubble a bit. Serve in a bowl, with a spoon to scoop up the sauce and pour over the rice. This serves 4 people – I always use 1 less egg than the number of people I am serving. Adjust accordingly. Also, I use a spice mixture I got at a Japanese grocery. It has seaweed, nuggets of wasabi and sesame seeds. If you cannot find this, add some crumbled dried seaweed strips (usually coated with soy or teriyaki) or just add some sesame seeds and may be half a teaspoon of mustard. Whisk together the eggs, sesame oil, spice mix and soy sauce in a small bowl, and set aside. Heat the small amount of oil in the same frying pan as you cooked the rapini until it just shimmers. Pour in the egg mixture and lower the heat to medium low. Allow the omelette to cook through, shaking the pan every so often, and using a spatula to encourage the uncooked egg to go to the bottom of the pan. 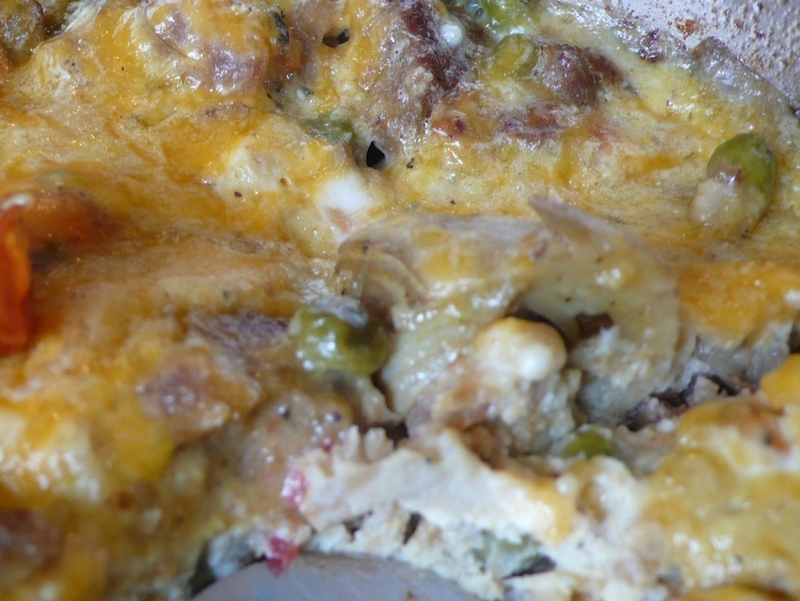 Once the omelette has cooked through, use your spatula to segment the omelette into quarters. Place on a cutting board or a plate and slice finely into thin strips. 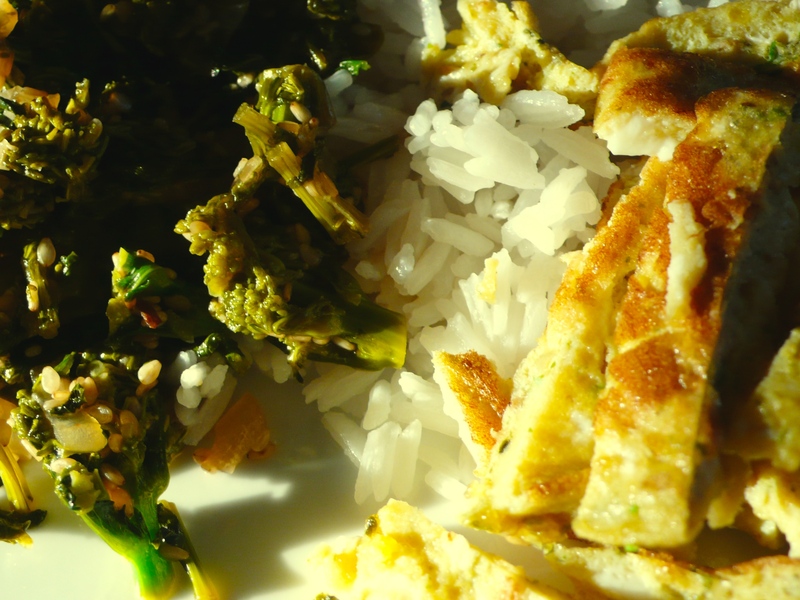 Serve with rice and rapini for a beautiful juxtaposed light meal. Today, around 11am, I realised I had a houseful of hungry women to feed – me, my sister, our mother, and the Au-Pair Nation (3 in total, though in M’s house it seems to be in constant flux! )… So went to the fridge to have a mosey about to figure out what I could cook. The quickest, easiest, and freshest thing seemed to be a spinach pie, with basil from the garden, and a ripe tomato to add colour, prettiness, and sweetness. I love cooking on the fly like this. I love checking out whats fresh, what looks delicious, and thinking up creative ways to cook it. This kind of meal is my favourite – unplanned, and yet with a certain urgency to it. We sat down to eat at around 1230 or so – and the cooking was really a series of pottering about, mixing, tasting, stirring, sauteeing… It was very organic (as were the ingredients), and even baby Z got into the equation when she went to the garden to help Essia pick the basil! This pie will serve 6 – 8 people for lunch, and is wonderful on a hot summer’s day as it really does taste wonderful lukewarm, or even cold. You can try it with lots of different toppings (sauteed onions or mushrooms come to mind), and you can choose to add or subtract cheese, as is your wish. I used some sour cream and a little milk with the eggs, but if all you have is condensed milk, water, cream – use that. Its a very forgiving dish, and will really adapt to what you have. Its also best, in my opinion, looking very rustic. This is not fancy restaurant fare. This is healthy, delectable home cooking, and it shouldnt pretend to (or try to) look polished and refined. There is a certain lustiness to this kind of cooking and food that people really respond well to. I baked this in a medium sized Corningware dish, but if you want to bake it in a pie pan, go right ahead. Its easy peasy, and so delicious. Plus, I find people love pie. It feels like you have done a huge amount of work, when you really havent – and they feel like you have treated them to something magical. Measure the flour into a small bowl, and grate the butter over. Use your fingers to mix the butter in well, until the mixture resembles coarse crumbs. Sprinkle the cheddar cheese and salt and pepper in, and using your fingers again, mix well. Break the egg into the flour mixture, and mix well, until a dough forms. Knead this dough, using the heel of your palm, until it feels very soft and elastic. Let it sit for about 10 minutes in the fridge, and then roll it out, very thin, flouring your rolling surface and pin first. Transfer the dough to your baking pan, ensuring that its even, and goes up the sides of the pan, and prick all over with a fork, remembering to prick along the sides as well. In a large frying pan, over medium heat, saute the chopped onion in the olive oil, and season well with salt, pepper and dried basil. Once the onion has become soft and glossy, add the white wine, and allow to simmer until the wine has almost completely reduced. Add the chopped spinach all at once, and saute until wilted. Remove from heat, and let cool for a few minutes. Chop the basil leaves fine, reserving 6 for the top of the pie, and mix the rest into the cooled spinach. Cut a large tomato into six equal slices, and set aside. In a separate bowl, beat together the ggs, sour cream, milk and 2 tbsp parmesan. Mix the egg mixture into the spinach mixture, and taste for seasoning. Adjust if needed. 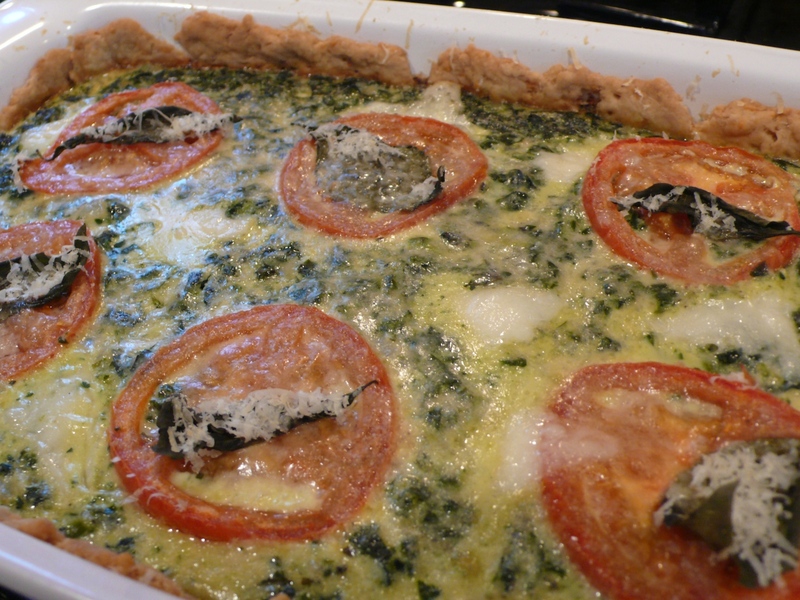 Pour the spinach-egg mixture into the pre-baked crust. Lay the reserved tomato slices on top, and top them with the six reserved basil slices. Strew a few chunks of goat’s cheese into the pie, if you feel like it (I kind of poked them into the filling), and sprinkle about 1 tbsp parmesan over all. Bake for about 40 minutes in a 170 C oven, and allow to cool for at least 5 – 10 minutes before serving. AngelKitten + N came over tonight to watch the Brasilians and the Portuguese play a very boring final match of their group stage, and I had promised them beans on toast! One of my favourite easy dishes that you dont really have to think about. I thought of jazzing it up with a poached egg on top. Going all out! Well, when I checked my cupboard, all those cans sitting so certainly in the cupboard were soup – no beans! Oh no! What to do?! From this moment of panic, delicious dishes are born. I did a quick once over of what I had in the fridge and freezer, and decided to make a savoury bread pudding. 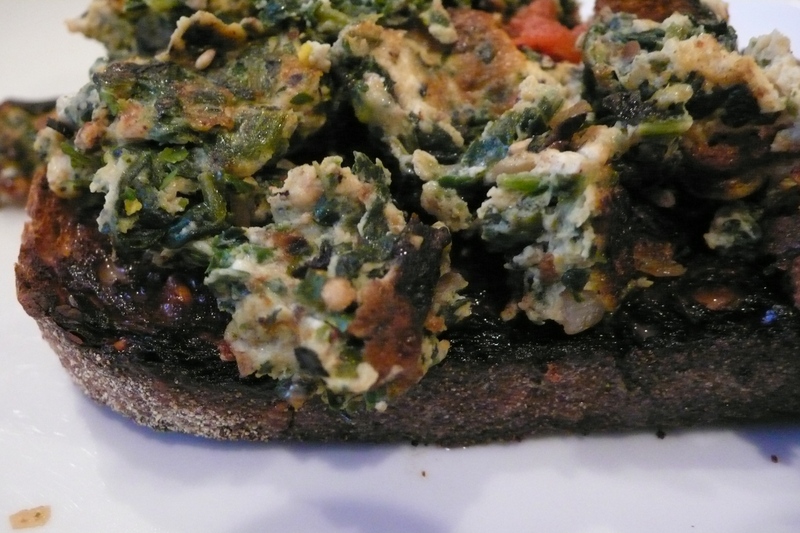 I had eggs, milk, cream, blue cheese, onions, garlic, old good bread, and a packet of flash frozen spinach. It took about 10 minutes to assemble, 30 minutes to bake, and it was REALLY good. Much better then the second half that we watched! This dish can serve about 6 greedy or 8 polite people. 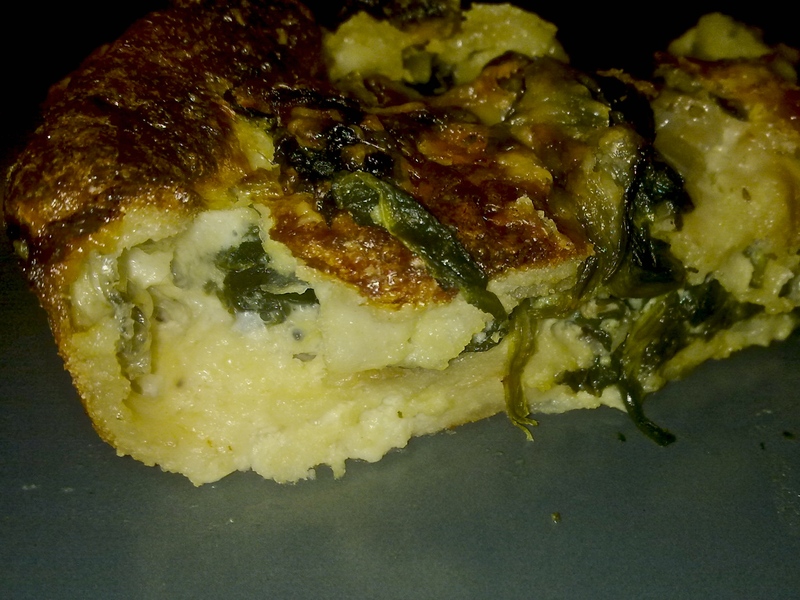 I baked it in a cake tin, so you could cut it like a quiche (or cake!) and it was perfection. In a shallow bowl or container, beat half and half with eggs, and season with salt and pepper. Set aside. Toast your bread, if you can. I didnt and it made a very unctuous bread pudding, but if you like the deeper flavours of toasted bread, and if you have the time (I was trying to get it done quick quick), then by all means toast away! Make some blue cheese sandwiches: divide your bread in half, and lay one set on your working surface. Finely slice the blue cheese (I tried to get the creamier bits as I didnt want to be overwhelmed with the blue flavour, but do as you like best) and layer sparingly over one set of bread. Cover with second set, and trim off the crusts. Poke fine holes in the sandwiches with the tip of your knife, and lay them in the cream and egg mixture. Set aside to soak up. Defrost your spinach. I dont believe in microwave ovens, so I dont have one, and obviously, if you can get fresh spinach, this would be best, but hey, I was working on instinct here! I used a large frying pan, and about 1/2 cup of water, and slowly defrosted over medium heat. When the spinach is fully defrosted, drain, saving the water. It will be spinach-y and delicious. Use a little bit of butter and olive oil in the same pan, and over low heat slowly soften the onions and garlic. Season with oregano and salt and pepper. Once the onions and garlic are glossy, add the spinach, just to heat through. Butter or spray olive oil in a large cake tin. Using your hands, take the eggy sandwiches, and tear about half of them into smaller chunks, lining the bottom of the tin. Layer about half of the spinach mixture on top, and repeat, ending with spinach. Pour about 1/4 cup of the spinach water into the remainder of the egg and half and half mixture, and pour all over the top of your bread pudding. Grate a bit of cheddar cheese (or other browning/melting cheese like parmesan) over the top, and pop in the oven for about half an hour. The bread pudding should puff up and get brown and golden on top. Serve immediately, though Ezril tells me its delicious cold too! When I was a child, we used to visit The Lodge on our way up to Fraser’s Hill, a resort just outside Kuala Lumpur. I used to obsess about the egg sandwiches at The Lodge – they were the highlight of our trip! I thought about them for ages, and finally decided to make them one night when we were watching the World Cup. So easy and quick, but totally satisfying. Toast the bread very lightly – you basically just want to warm it and get a crisp exterior going. As soon as its been toasted, butter well. Meanwhile, beat eggs, egg yolk, salt and pepper and a dash of milk or cream together. Use a fork, and don’t beat too crazily – you just want it combined gently. Over medium heat, add a bit of butter to a non-stick pan, and add the eggs. Use a rubber spatula, and mix very gently. 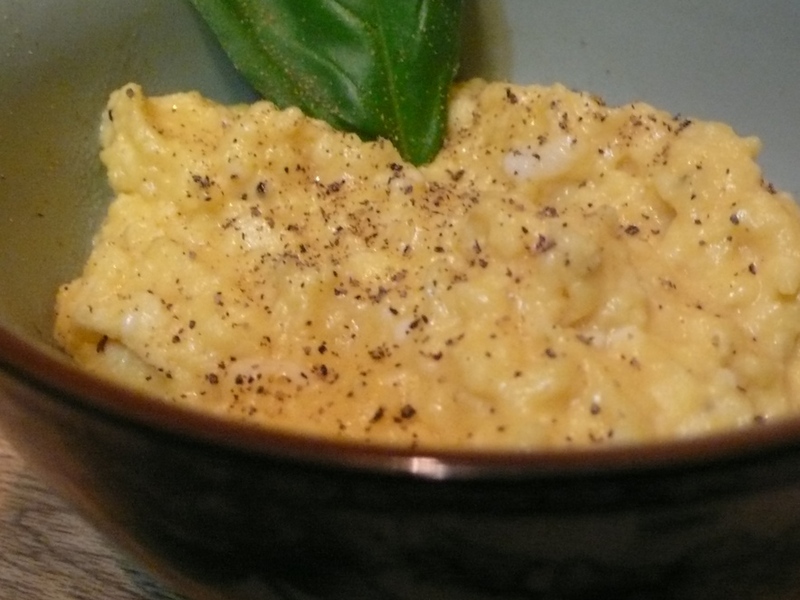 The eggs will be golden colored and very creamy because of the extra yolk. It should take only a few minutes before you have very gently scrambled eggs. Divide between four pieces of bread, top with a buttered slice of bread and press down well. Cut into half and serve immediately to grateful and hungry hoards.